Great value for money, a fantastic night's entertainment from an extremely talented duo with a full band sound. Featuring producer singer/song writer Phil Muir who has toured the US, and talented session vocalist Sarah Muir, husband & wife team. DeMuirs are experienced skilled musicians who enjoy working collaboratively together. 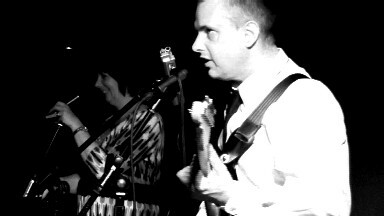 DeMuirs perform an engaging mix of pop, rock and soul from the 50's to the present day. Their repertoire features songs and tunes that are lively, cheerful and upbeat, perfect for creating that party atmosphere! Musically, DeMuirs are about strong harmonies & skilled musicianship to catchy classic hits, causing the faster songs to groove, & the slower songs to be more soulful. DeMuirs will provide you with an excellent night’s entertainment, performing songs to a very high standard, and on many an occasion will get your audience dancing and asking for more!! Phil plays lead & rhythm guitars cranking out fantastic guitar solos while singing both main & backing vocals. Sarah plays acoustic guitar and is known for her rich main vocals & strong harmonies..
What they do is supplemented with their own custom - made backing tracks, to a very high standard with real instruments, through a top class high powered PA system, projecting a full band sound. DeMuirs are totally self-contained, providing a high-quality PA system and stage lights to really enhance the performance. DeMuirs are available for Corporate functions, weddings & parties and can play venues of any size. Whether it’s a 50th party at Haynes motor museum or, a wedding at Studland Bay House in Swanage, DeMuirs no what is required to get the party started!